INOR is now introducing a new line of temperature sensors especially suited for applications with limited space. The new compact sensors follow the current trend in various industries where in standard applications traditional temperature sensors are replaced with compact ones, especially in OEM applications. Their main advantage is their size: as in many process and OEM applications there is only limited space for sensors, making the Compact sensors a perfect solution. 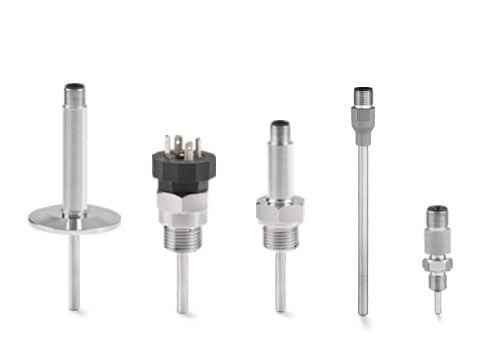 Unlike traditional sensors that have to be configured by choosing from various combinations of measuring insert, connection head, thermowell and transmitter, the compact sensors are pre-configured to meet the most common requirements in terms of measuring range, immersion length as well as process- and electrical connections. Just to make the buying process as simple and smooth as possible. Classed IP67 (IP65 for TRA-C20), the sensors are dust tight and can be used in wet outdoor environments. The solid mechanical design has no moving parts, which makes the sensors highly resistant to mechanical stress or adverse environmental conditions. The conpact sensors are optimized for use with the temperature transmitter IPAQ CT20. Assemble the sensors with the IPAQ CT20 via the integrated M12 connectors and you have a complete temperature instrument.